Cuts, open wounds, other external trauma, internal bleeding or hemorrhaging (such as bleeding gastric ulcers, haematemesis, haematuria, haemoptysis and epistasis). Also, gynaecological conditions with blood stagnation including menorrhiagia, dysmenorrhoea, amenorrhoea, postpartum or post termination blood stagnation and haemorrhage, placental retention, fibroids and painful gynaecological masses. Ajuga forrestili Diels, Dioscoreae, Parviflora Ting, Berba Gerranil & Herba Erodii, Herba Inulae Cappae, Radix Notoginseng (Tian Qi), Rhizoma Dioscorea Nipponicae, Rhizoma Dioscoreae, etc. For wounds by knife, gunshot or traumatic injury, menorrhagia, metrorrhagia, take with warm water. For wounds with stagnated blood, swelling and pain, disease of gynecopathy, take with wine. For initial stage of venomous sore, administer a dosage of 0.25g and apply on infectious area with a portion of powder mixed with wine. Do not apply powder on suppurative sore. For slight injury and other internal hemorrhage symptoms, administer orally. Take insurance pill (the red pill) for severe traumatic injury. 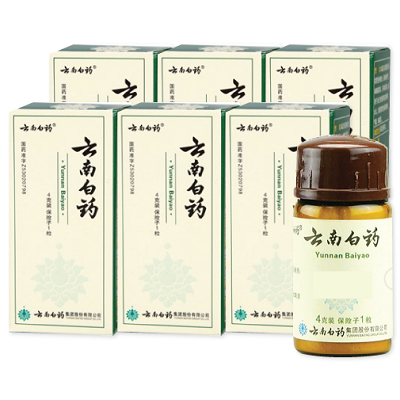 Yunnan Baiyao should be used only after consultation and in cooperation with your dog’s veterinarian. For cats refer to instructions above based on weight. Best to give on alternating days, or for a 5-day on, 5-day off cycle that repeats. If breast-feeding and children under 18 years of age, ask a doctor before use. (4 ?/? + ??? 1 ?) x 6 ?/?